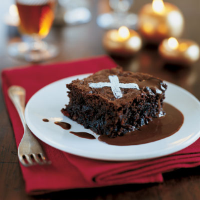 These squidgy brownies are a real crowd pleaser and a wonderfully indulgent winter dessert. Because it's a games night, use a handmade template to dust the squares with icing sugar noughts and crosses! Preheat the oven to 170°C, gas mark 3. Grease and line a 24cm-square cake tin. Put the cherry chocolate and butter in a heatproof bowl set over a pan of barely simmering water for 7-10 minutes, or until melted. Stir well, take off the heat and set aside to cool for 5 minutes. Place the eggs and 175g sugar into a large mixing bowl. Using an electric beater, whisk together for 3 minutes until pale and foamy. Fold in the melted chocolate then sift in the remaining dry ingredients and fold through. Gently stir in the cherries and pour the mixture into the prepared tin. Place in the oven for 40-45 minutes; it is cooked when a skewer inserted into it comes out with moist, but not raw mixture. Remove from oven and set aside to cool in the tin for at least 30 minutes to allow it to firm up. When ready to serve, make the sauce by placing all the sauce ingredients in a heatproof bowl set over a pan of barely simmering water for 5 minutes, or until melted. Stir well, whisk until smooth, then transfer to a serving jug. Cut the brownie bake into 16 squares, dust with icing noughts and crosses. Serve with the hot chocolate sauce and either vanilla ice cream, single cream or crème frâiche. The brownies can be made the day before if well wrapped in clingfilm and stored in an airtight container.